Club Penguin Cheats by Mimo777 Club Penguin Cheats by Mimo777: Club Penguin New Game This Week! Woot! We were right! The missing puffles have something to do with the new Club Penguin game! Underground explorations at the Cave will continue, and a new game will be found. Keep checking back, because the new game will be here this week! So, it will be cool to have a new Puffle game, don't you think? And SHARKS!? Very addicting Run Bamster Run! Hamster game! Cant wait till the new game! SWEET! Can't wait for the new game, seems like it would be kind of like puffle round up... Cool Mimo! YAY! Mimo gave me credit! Hey mimo! Just so you know on the club penguin home screen, with rockhoppers ship, yarr will still jump out of the crow's nest evey once in a while. Something tells me that club penguin was just to lazy to change this! Hm mm. In this game, will we see Herbert? Or maybe a shark or something else. Maybe, when it's released, the new mission will come out! So, i'm guessing that the cave game will be in the water. (because of the sharks...) but what if it were megatron land sharks that could transform into a GIANT MIMO! Ahh, we would all run and be afraid, but we would think giant Mimo's are cool. Until he squishes us. :/ Hmmm... Oh yes, and Toysgoneby, you are an AWESOME MODDER! I just asked that to him like 5 seconds ago! Yup he probably will! I went to Toys R Us today...They didn't have the orange puffle :'( BUT...(You probably already know this but I have never seen these before! )They did have puffle plush clips! Like that RH clip you got, Mimo, but they are puffles and they are really tiny and plush! Did you already know this, because I didn't! ...Maybe! We can foil Herbert and Klutzy's plan to...well, to do whatever they are doing! Mimo? Are? Mod? Changes? Coming? Soon? Maybe? No? Yes? Why? Do? I? Keep? Asking? Questions? Help? Me? Please? Well Anonymous, I think we will see anything from grumpy polar bears to fierce dragons in this game, who knows. On a blog post, Billybob said the new mission would come in a couple months, and if the new game comes this month, I don't think they will come out at the same time. Yes, but it will probably lead to something. Usually, when there is one puffle, the is a whole bunch... We will just have to wait and see! Knowing how awesome.. Ah Hem, Uber you are, I am sure Mimo will follow you! You make good points, and present really cool ideas. Hopefully you are right! Since you are both great Mods, you are probably right! yay! :) im soo exited ive been waiting for a puffle game to come out well i kno theres puffle round up but that games kinda borin.......:) but yay! Hi! That's a really good theory! I hope we see herbert! Hi mimo! I want to say something. How there was a shark remember the underwater cave is down there so maybe there are sharks in there! i have the perfact Theory Maybe! 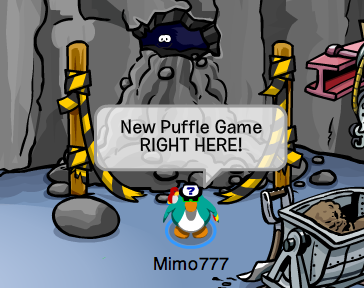 the puffles Escaped to the cave and they got stuck in there! and then they fell into the water And There Are Sharks there! and We Have to rescue them Before they turn into Shark Bait! Lol Like My Theory!? ☺ p.s if you want to know how to do that smiley face i did put your keyboard in Number Lock and click Alt 1 ... Bye! cool! i cant wait to see the new game! I was thinking about that..... I though it was still there from the underwater room....... Evidently, I was wrong. I doubt it. The mission releases in a few months, the new game pretty soon. Herbert is probably related to the mission and the game. The shark was mentioned in one of Mimo's previous posts. Hope this helps! Mimo didn't mention it! Quick, ask him to give you credit! Uhh ya it is, but those rocks will be cleared, and the caves will be back!! The new game will be inside the caves!! The puffle is there to tell us it will have to do something with puffles. Awesome! I can't wait for the new game. Yup there might be. Lets hope the sharks don't get Yarr(if he is in there!) I can't wait too! Mimo,do you remember the drill we voted that can make trees? when will it happen? this month? next month? Maybe! I don't know, But I think its a good idea! I hope new mission comes out really soon... There's nothing on notice board at the PSA Head Quarters... Hmm. kl hmmmmmm i bet the cave place will be a new room thats why one screen is blank in the secret agent room! i bet u yarr and the night club puffle are in the mine hole and that means rockhopper stays longer sweeeeeeeet!!! Do yiou really think there are going to be sharks I am scared of them.Any way it's great we will have two games in the mine.I can't seem to get my mind off it it is so cool I think yarr and the other missing pufles are in the cave.Are you sure it comes out this week? Mabye, that would be awesome! Lol mabye it will be. It looks like it's gonna be awesome! It looks like there will be sharks in the new game since the picture for the new game has a shark on it. Cool! Did you get one? I would have! Thanks for the congrats! Thank Ypu! Thank You! You are all to nice! I would like to thank the academy, my pet Juanita, and Mimo! LOL! Thanks for all of that! Wow... that is some lazy work.. Good Observation! Maybe! Doesn't it make you wonder why that Diver's Suit item was so cheap? Will we have to wear it in the game? Quick! Ship it to Mimo! LOL. Mimo mentioned the Rockhopper clip, but not any puffle clip! Good Job Hnw! It will appear in April.... Most likely for Earth Day.... Can't Wait! With all due respect, there was nothing wrong with that comment. She simply asked when mod changes were going to happen. I really do not see how that did not "set an example." I don't really mean to be like Scrooge, but that comment sorta bothered me.... That is my 2 cents. I? Hope? So? I? Want? Them? Too? Mod? Changes? Please? Its? Been? Over? A? Month? Mimo? Help? Me? 3.14? What? No? Sense? I? Am? Making? E=MC2? Ahhh? I remember that! It will come in April. Trees! Trees! Get 'em while they're... umm... treeish? I really hope I'm a Mimo Mod when Mimo does the update! If not, I might dye! I will go over to my friend's house and tye-dye my shirt! L? O? L? U? Crack? Me? Up? Sometimes? I? Like? Cookies? With? Icing? Someone? Get? Me? A? Mental? Pill? Mimo rox my sox! Unfortunately Mimo can only meet you if you are a Mimo Mod or higher. Sorry! Ugh, I! Am! A! Girl! :S But thanks for sticking up for me. Yeah! Toys is the best Modder besides you Safa! Remember when I was the first to be a Super Mod right away? I bet that's gonna happen to Toys soon! christopher said... Oops i mean saweet! ~~~~~~~~~~~~~~~~~~~~~~~~~~~~~~~~~~~slippeestars here you said it the game will be saweet!and the new room! wilbur5700 said... cool mimo you kno who! ~~~~~~~~~~~~~~~~~~~~~~~~~~~~~~~~~~~slippeestars here yes very awsome coolnes i am unpationt so cant wait so im glad cp puts it on thursdays like at one o clock so cant wait! toysgoneby said... yay!mimo gave me credit! ~~~~~~~~~~~~~~~~~~~~~~~~~~~~~~~~~~~slippeestars here cool and yay for me your staying! bobhead202 said... i was right! ~~~~~~~~~~~~~~~~~~~~~~~~~~~~~~~~~~~cool it is fun to be right like if you perdicted something and your rite its cool i get exited when that happens! slippeestars here i need it i cant wait it is probly most like hirdro hopper mabey just thinking? You might want to tell him that on twitter. That's how he is following me now =D. polka said the same thing on twitter! also, heh heh, can YOU follow me on twitter too?